Gabriele Rossetti, drawn by his son Dante Gabriel Rossetti. Dante Gabriel Rossetti, Victorian poet, painter and co-founder of the Pre-Raphaelite Brotherhood, grew up in the shadow of Dante Alighieri. 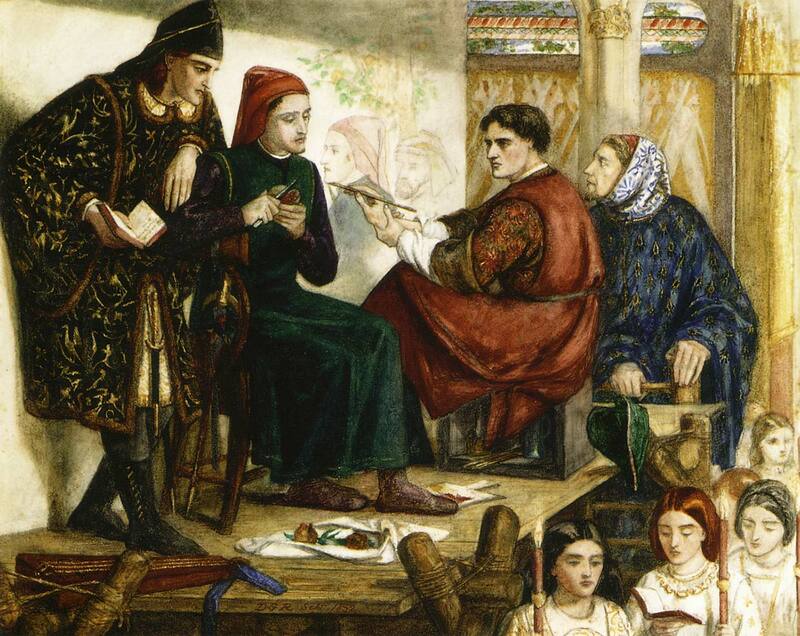 Although he lived several centuries before, Medieval poet Alighieri was a permanent fixture in the Rossetti household. 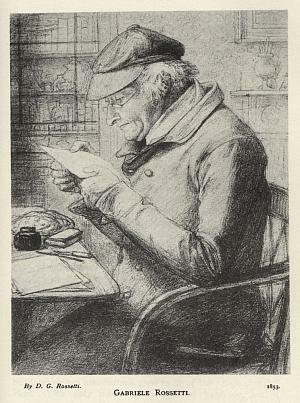 Rossetti’s father, Professor Gabriele Rossetti, was an Italian expatriate who came to London in 1824. He was a Mason and he believed that in Dante’s works (Vita Nuova and Divina Commedia) there were allusions to Freemasonry. It became his life’s work to find and prove these connections. Unfortunately, his beliefs were unfounded and the connections he tried to make were tenuous at best. After his death,his wife burned much of his work. I strongly recommend that you read Dinah Roe’s book,The Rossettis In Wonderland: A Victorian Family History , which is an in-depth account of the Rossetti family and delves into Professor Rossetti’s Dantean scholarship and the effect it had on his family more deeply than I can here. In 1828, Professor Gabriele Rossetti named his oldest son Gabriel Charles Dante Rossetti. The reasons for ‘Gabriel’ and ‘Dante’ are obvious; ‘Charles’ was chosen in honor of Charles Lyell who was chosen to be the boy’s godfather and shared Professor Rossetti’s passion for Dante. 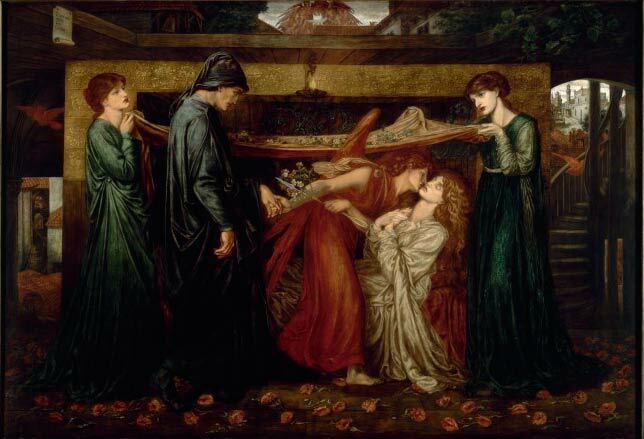 After Lyell’s death, his godson dropped ‘Charles’ and used the name Dante Gabriel Rossetti professionally from then on. Among friends and family,though, he was always known as Gabriel. The influence of Dante Alighieri was Gabriel’s birthright; he was an inescapable ghost in their home. Although in his younger years he preferred English writers such as Shakespeare and Sir Walter Scott, Dante seems to have been absorbed into Gabriel’s DNA and became a frequent subject of his work. 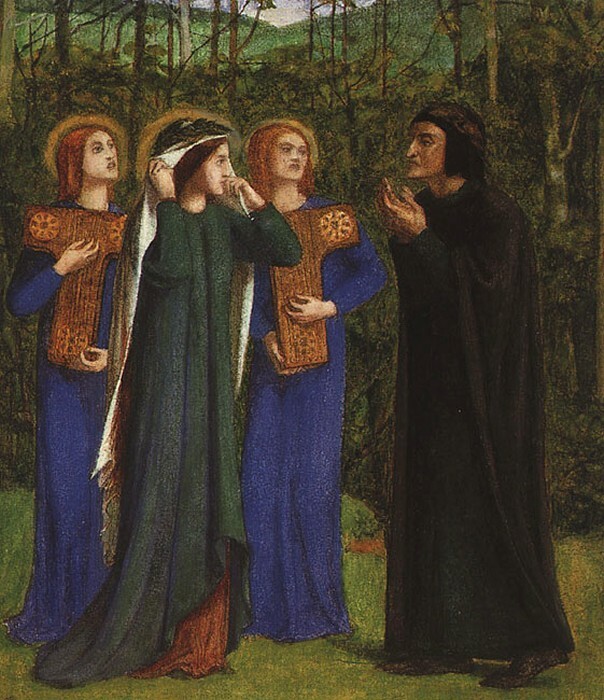 Gabriel would later translate Dante’s Vita Nuova and his own personal life and relationship with Elizabeth Siddal would seem at times to parallel Dante’s love for Beatrice, the love immortalized in both La Vita Nuova (The New Life) and Divina Commedia (The Divine Comedy). 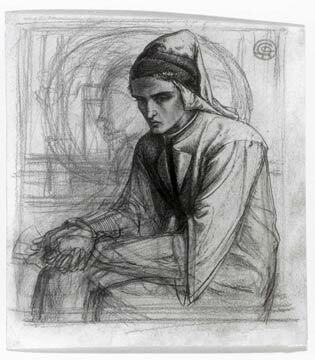 Rossetti’s drawing of Dante above fascinates me, as it is inspired by a copy of Seymore Kirkup’s painting of a lost image of Dante. 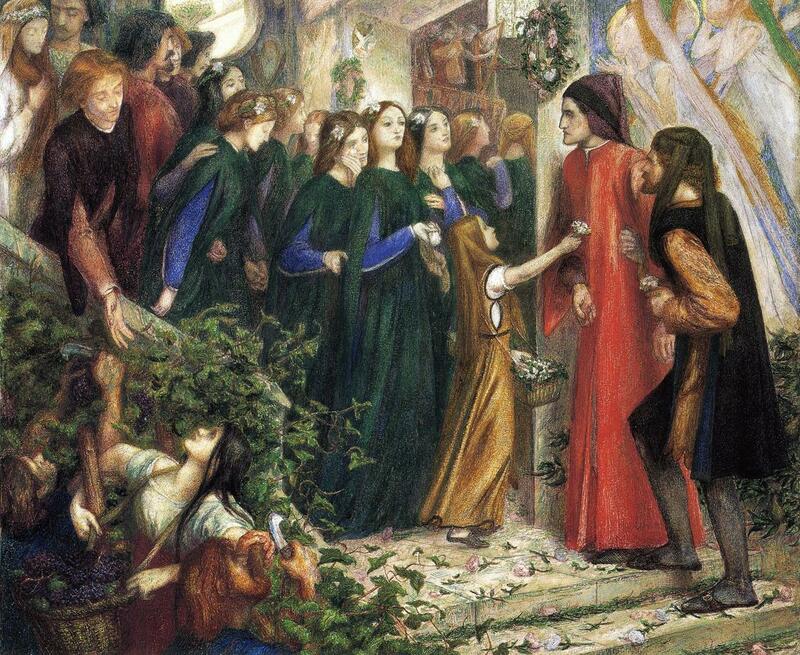 Kirkup, an artist, was a friend of Rossetti’s father and shared an intense passion for Dante. In 1840 he began searching for a lost portrait of Dante painted by Giotto. Upon finding it, Kirkup made a tracing and a painting of the lost portrait, which was fortunate since the original was destroyed during restoration. Image via RossettiArchive.org This image may be the copy made by Kirkup, or it may be a copy of Kirkup’s work by Rossetti. It remains unidentified. The original was part of a fresco discovered under whitewash by Kirkup and his party. Rossetti painted a recreation of Giotto painting the lost portrait Kirkup discovered. While Giotto paints his portrait, Dante looks at his unrequited love Beatrice. 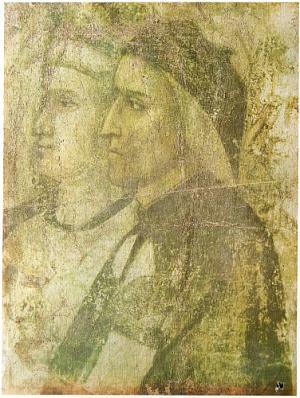 Also seen in the painting are the artist Cimabue (looking over Giotto’s shoulder) and Guido Cavalcanti (the Dante’s left). Siddal also appears as Francesca de Rimini, taken from Dante’s Divine Comedy. In Canto V, Dante encounters lovers Francesca and Paolo de Rimini in the second circle of Hell. When Francesca first meets him, she quotes great works to him (including his own). This establishes Francesca’s great love for reading and she later tells him that she fell in love with her brother-in-law while they read the tales of Lancelot together. Francesca and Paolo then brought the King Arthur/Guenevere/Lancelot triangle to life by pursuing their relationship. When Francesca’s husband caught them, he stabbed the pair to death. They remain in the winds of the second circle of hell, along with other famous lovers who have sinned. 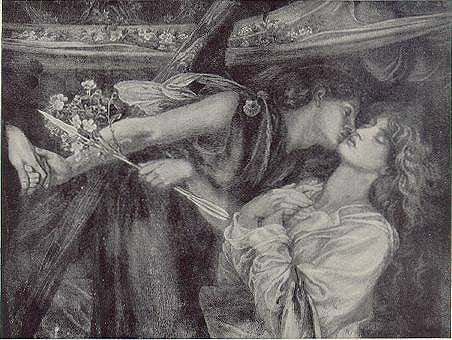 In Rossetti’s triptych design, we can see the lovers kissing as the read Lancelot, Dante and Virgil in the middle as they encounter the pair, and the lovers as they brave the winds of Hell. 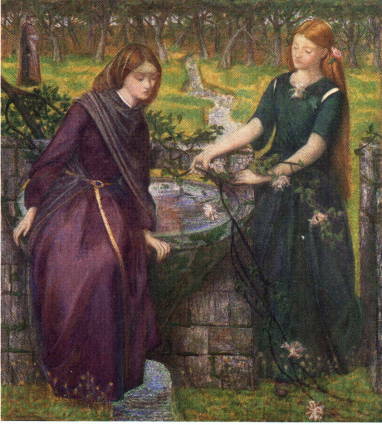 Rossetti completed the work in a rush in order to sell it to John Ruskin. Elizabeth Siddal was traveling in Paris at the time and was short on funds. 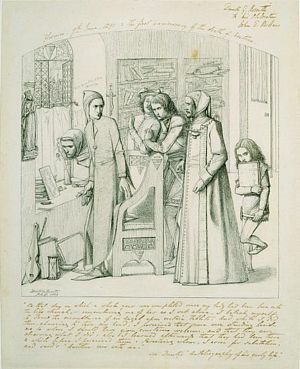 Ruskin’s purchase allowed Rossetti to visit Lizzie in Paris and bring her the necessary cash. As I read Canto V of the Divine Comedy, I was interested to see the imagery of birds. As doves/By fond desire invited, on wide wings/and firm, to their sweet nest returning home/ Rossetti frequently described Elizabeth Siddal as a dove and used bird-like references when discussing her. He called her dear dove divine in a Valentine poem and had been known to use a heiroglyphic of a dove to represent her in letters written to his brother. He once wrote to his sister, poet Christina Rossetti, describing two dresses that Lizzie made as making her look like a “meek unconscious dove” and a “rara avis in terra” (a rare bird in the lands). 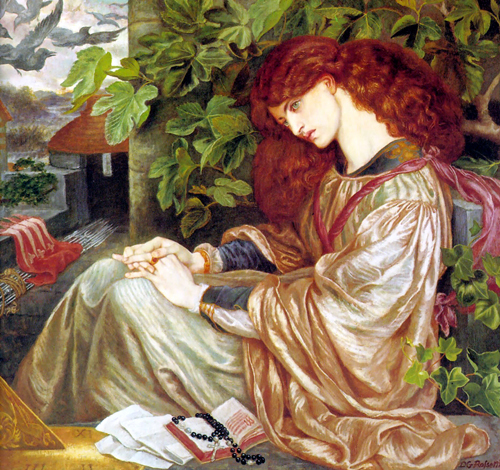 I wonder if the bird symbolism in relation to Francesca de Rimini inspired Rossetti’s use of it in relation to Siddal. 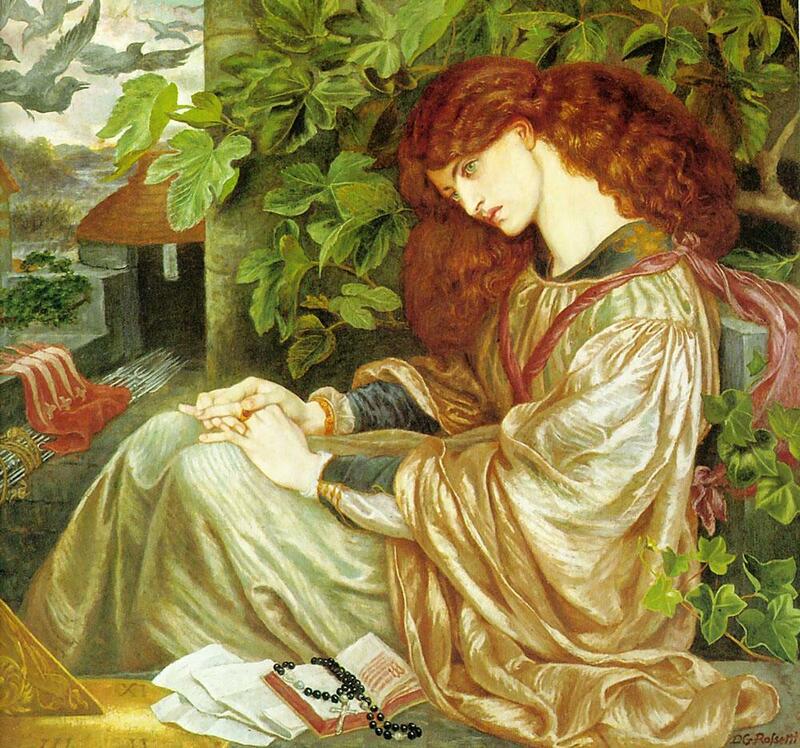 Or perhaps, like Rossetti’s father, I am seeing connections where there are none. 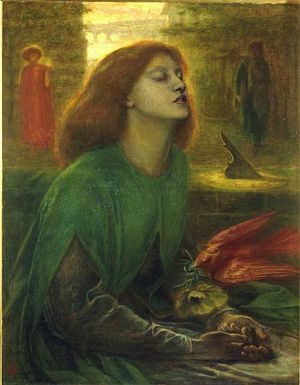 Rossetti was influenced by Dante’s Beatrice and Poe’s The Raven when he wrote The Blessed Damozel. This idea of love after death would take on a deeper meaning after the untimely passing of Elizabeth Siddal from a Laudanum overdose. His identifying with Dante had reached a frightening new level. With his wife no longer a living muse she becomes an even more Beatrice-like figure, unreachable in the after-life. In his posthumous tribute to her, he painted her as Beatrice on the brink of death. In the background of Beata Beatrix, we see the figure of Dante and the allegorical figure of Love. 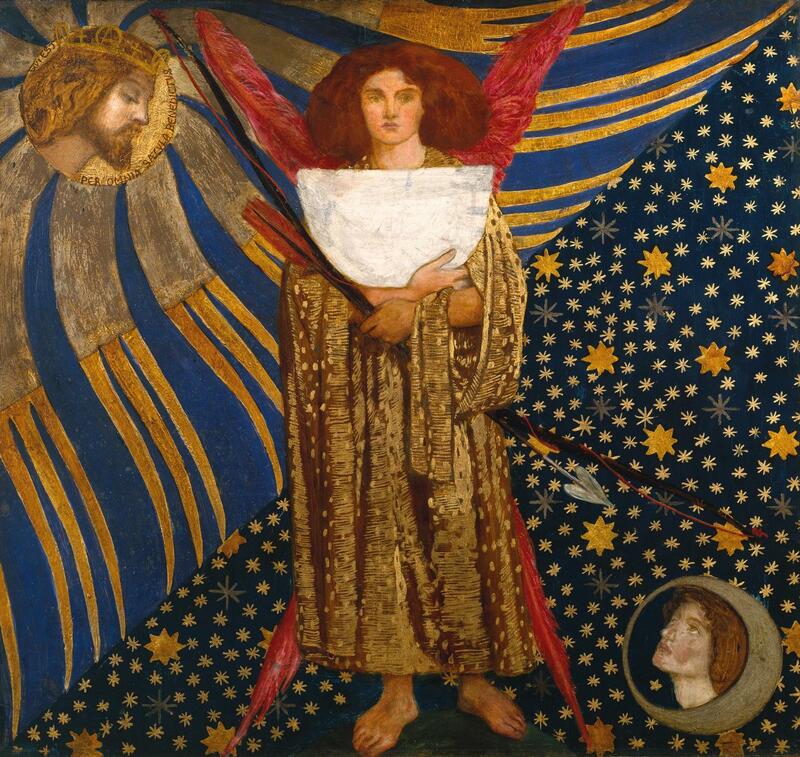 Love also appears as the center figure of Dantis Amor, completed in 1860, the year Rossetti and Siddal were wed. Rossetti had been working on this design since 1848. Dantis Amor (Dante’s Love) includes a quotation from the Vita Nuova: ‘that blessed Beatrice who now gazeth continually on His countenance qui est per omia saecula benedictus’ (Who is blessed throughout all ages). 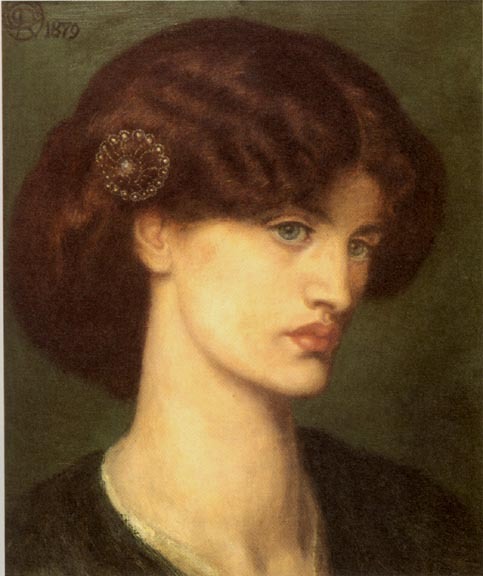 After the death of Elizabeth Siddal, Rossetti fell in love with Jane Morris, the wife of his friend William Morris. As with Siddal, Jane became his muse and is also seen in Dantean works. In La Pia de Tolomei, she appears as Pia from Canto V of Purgatorio in the Divine Comedy. 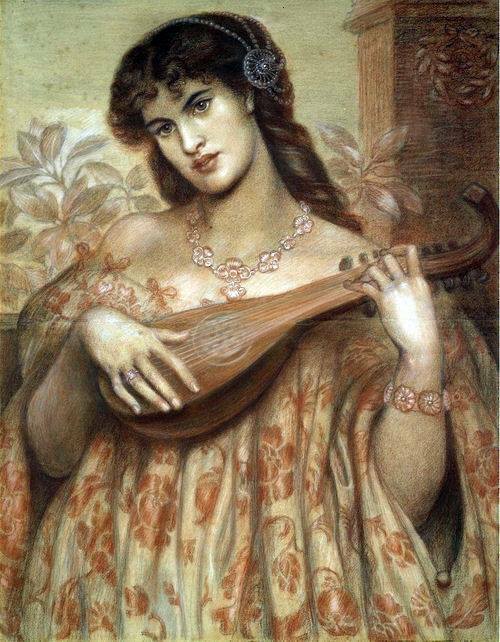 Rossetti also painted Jane as Beatrice in this uncharacteristically simple work. Devoid of his usual props, flowers and symbolism, Rossetti casts Jane as the role once held by his wife. Note the spiral hair pin. 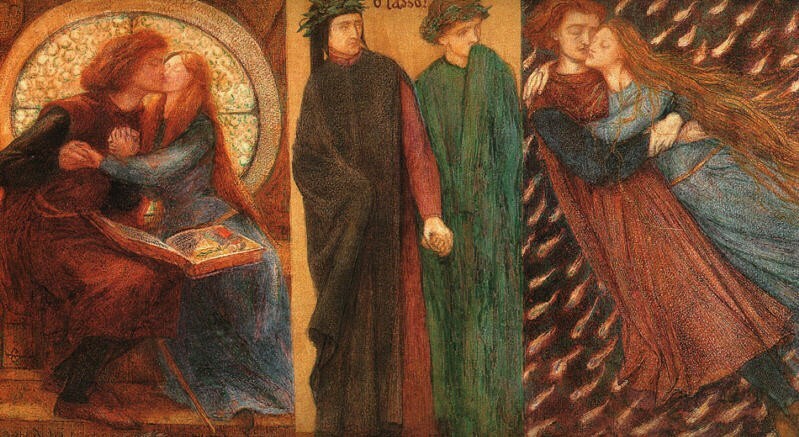 Dante is a thread that seems to weave continually throughout Rossetti’s life. His interest may have been initially inspired by his father’s fanatic scholarship, but through Rossetti’s translations and his striking paintings of Dantean subjects, he has definitely made the world of Dante his own. An informative and fascinating read, there is always so much more to know about the pre-Raphaelites and their influences.